Check out this video of the press conference with Joe Torre and Andre Ethier after the game. Here are some pics currently floating around the nets. 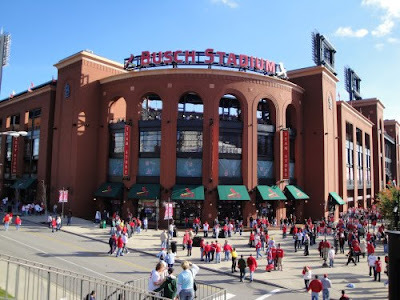 Outside of Busch Stadium about an hour before the game. Pic from Rich Hammonds LAKingInsider blog who were in town for a game against the Blues that same evening. Celebrating in the clubhouse. From MLBTwitPic. 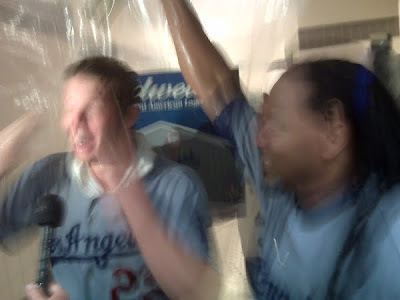 Is that Manny giving Kershaw a champagne bath? Manny gettin' it. 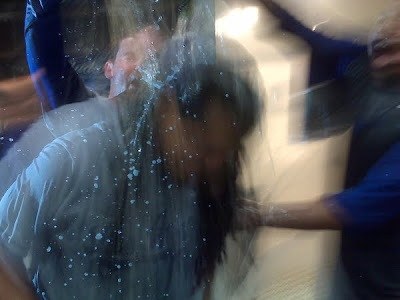 He kept running for bathroom to escape & then sneak-attacked teammates. Champagne-spray artist. 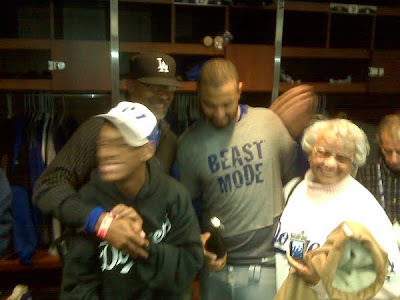 UPDATE: Matt Kemp celebrates with his family in the clubhouse.